Day four of the Liebherr 2017 World Table Tennis Championships saw a child prodigy continue his rise. The King is dead? Tomokazu Harimoto has staged a coup d’etat and dethroned Jun Mizutani in Düsseldorf. The thirteen year old defeated the number six seed 4-1. Is he too young to take the throne? Harimoto doesn’t think so. Stat chat: Hugo Calderano is a statistical anomaly. There are 32 players remaining in the Men’s Singles draw. There are 16 players from Asia, 15 from Europe, and one lonely Latin American. Calderano saw off Noshad Alamiyan in straight games and is now carrying a whole continent on his back. German gold? The mixed doubles is looking like the best chance for Germany to find a place at the top of the podium. Petrissa Solja and Fang Bo are hot stuff here in Messe Düsseldorf. They are through to the semi-final, having only dropped one game. Keeping it clean: Team China is yet to lose a player. But today their women’s squad kept a perfectly clean sheet and didn’t drop a game. He said what?! 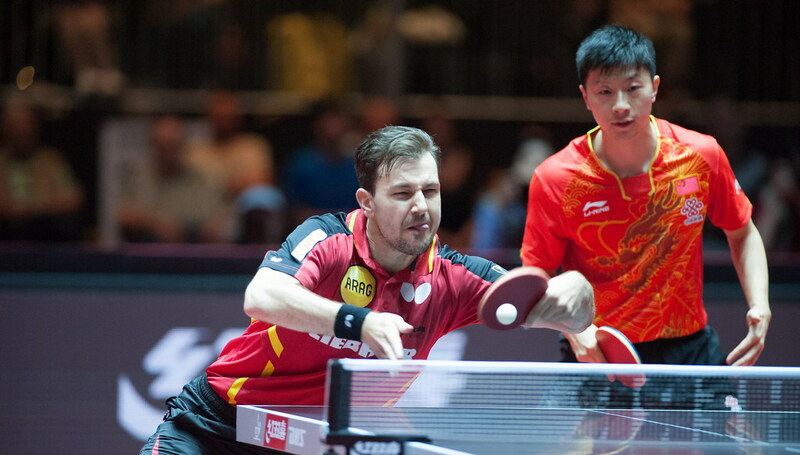 Zhang Jike is getting in the swing of things in Düsseldorf. He took down Robert Gardos (AUT) 4-2 just metres away from his screaming fans. But maybe a little shush would be appreciated. Tactician: Tactical play of the day has to be given to Dimitrij Ovtcharov. Despite the home ground advantage, the German team was having a tough time here today. Luckily Ovtcharov gave them something to cheer about. He took down England’s Paul Drinkhall 11-3,5-11,11-4,11-5,11-5, but it was timeout that secured the win. He won the next five points and cruised to victory.